One of the most beautiful and finest architecture of Jhunjhunu is Khetri Mahal. It is also known as Wind Palace of Jhunjhunu. Khetri Mahal was constructed by Bhopal Singh around 1770. Bhopal Singh was the grandson of Sardul Singh. It is strange to know that despite being known as Wind Palace the famous Khetri Mahal is devoid of any doors or windows. Sawai Pratap Singh of Jaipur was so intimidated and inspired by this unique structure that he built the grand and historical Hawa Mahal in 1799. Khetri in itself was considered to be the second wealthiest ‘Thikana’ under Jaipur. Khetri Mahal is located behind a series of lanes. It is considered to be one of the perfect examples of Shekhawati art and architecture. It is primarily known for its exquisite arrays of paintings and murals mainly supporting the Raghunath temple and Bhopalgarh fort. The uniqueness lies in the continuous flow of wind which invariably makes this structure stand apart from many other such buildings. Pillars have replaced the giant wall structures where ever possible in order to maintain the steady flow of gusting wind in the palace. One can notice the long ramp leading to the vast terrace of the Mahal from the entrance. This was specifically designed to provide ease to Rajputs in riding their horses. In fact the various levels of the Palace are combined with terrace through a series of such ramps. Another objective of these ramps was to provide high enough platform for ‘Thakurs’ to gaze down at their subjects without much effort. The view from the rooftop is particularly worth observing. You can also discover two small alcoves with the fragments of lost era paintings in the private chamber of Thakurs. Most of these paintings were in natural earth pigments. 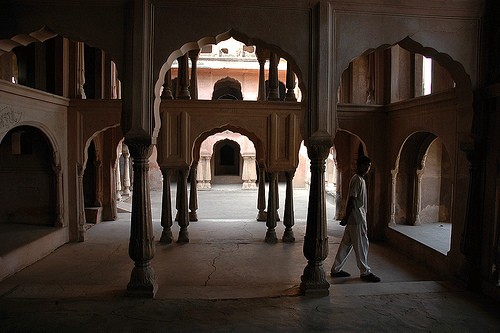 Inside of Khetri Mahal, one can explore huge graceful halls with intricately designed arches and pillars. The most amazing discovery you can make in Khetri Mahal is that it has no doors or windows quite unlike other Mahals. Most of the rooms instead are connected through each other by a well designed series of arches and columns. These arches and columns provide a beautiful symmetrical view to the Palace. The age old lime plaster has been left to its own glory and has a rosy shine in it. Though Khetri Mahal no doubt is one of the rare and unique structures of the Shekhawati era, but the forlorn state of this building is an unfortunate reality. The Palace state as of now certainly requires some immediate attention from the authorities. Such architecture is rare and soon fading, the upkeep and preservation of these unique structure and murals can surely be a huge boost to our Indian tourism and culture. its really a very beautiful pic……. I am native of khetri and it”s really very nice to see these picture’s. Nice pictures. Excellent piece of architecture of that era. But government’s apathy towards its maintenance would lead to its ruins. Rajasthan tourism must act upon it to make it a tourist destination etc. Khetri is a great place ,I visited the mahal in 1984 in my school days .at that time the condition of mahal was not so good, our government and local bodies should have some provision to maintain these assets. this place is less than a minute away from my grand-mother’s place. its beautiful. its the first things you can see from the terrace of the house. i have been inside a couple of times whenever i have been to Rajasthan. but its a shame that the locals don’t really care about it. there is feces every where! and names of lovers etched on the walls……the locals really don’t care about it, including the local goverment.